Welcome to the BGMS Ipad Instructional Integration blog: Thirty iPads, nine teachers, two administrators and 400 students. This month the iPad team will be posting about their plans for May. Most of the team has had five or more months of working with iPads in traditional (and non-traditional) academic settings. And as we approach the close of the year we don't want to leave any stone unturned. As necessary as setting a firm instructional tone in your classroom at the beginning of the year, having a strong plan for instruction for the closing months of the year is equally important. With the addition of iPads to many of our classrooms, the shape, face and sometimes space of our classrooms has changed. The procedures we had in place for teaching with papers & pen have evolved for many of us after years in the classroom. Now we are faced with new capacities, new procedures, new methodologies. How can we take these changes, these new shapes of instruction and use them to propel us into a time of year when students are often disengaged physically and emotionally? How can we take the successes of the past five months and use them to fuel what is left of the year? Or, is there any stone left unturned? Is there something we wished we would have done with our iPads that we were putting off? Perhaps now is the time to try? It is my last month with the iPads. It was very clear what I would do with my class. I wanted to listen "We Didn't Start the Fire" by Billy Joel and know what every reference was. So, that's what we're doing. I never thought my students would respond so well to the song. However, if I have to hear that song again I may never do this project again. Students should have their research posted by next week. Now, we are in the song writing phase, where students will write songs that have historical events monumental in their lives. Please feel free to comment on their songs when they are completed next week. I think Posterous is a great site for sharing. It's an organized blog on steroids that allows for a ton of contributors and students can post via email. Since they all have Bronx Green emails it is a very easy project. 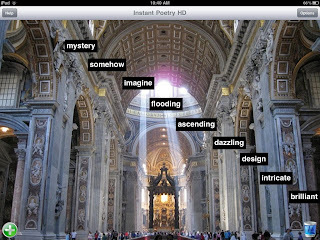 Posterous can be used on the iPad and it allows students to dabble in blogging. This is definitely something I wanted to touch upon before they went to high school because blogs are now the expectation in many college classes and high schools. Please check back for songs as they are posted ! As the year winds down, many students have been known to start their summers despite the fact that school is still in session. They have a hard time focusing in class, do less homework, and behavior also begins to deteriorate. I plan on using the iPad to combat these end of year issues. We will be completing a project involving vocabulary words that we have used throughout the year as well as practicing a post-May topic: Map Scale. We can use the iPad to research mathematic vocabulary, provide illustrations/examples, as well as to find related topics to each word. As for the Map Scale chapter, Google Maps along with other map images on the internet will be the material that students will use to explore the relationship between map scale and proportions. Students will be able to look for a specific region/area that interests them and then use the map scale to measure distances between different cities in that region. I will be using the IXL program on the iPad during class. With student motivation to complete homework at such low levels, I plan on allowing students to "replace" poor homework grades with extra credit if they spend some time practicing different topics on IXL. Finally, I also plan on using the iPad as a reward for students who are making the right choices. Being able to surf the web, play different games, and even listen to music using the iPad can be a great incentive for students to do their work and exhibit good behavior in class. Reflecting on the past school year I've come to realize some great things have occurred in 6th Social Studies with the use of iPads. We’ve researched information, typed essays, found correlating images, created webpage’s, played games, inputted data, watched videos and listened to music. Now winding down to the final five weeks of school there is still a great deal of work that needs to be completed in Social Studies and the iPad is one solid way to keep my students engaged after the few stressful weeks of state tests and the slow emergence of Spring in NYC. At the present moment my students and I are learning about various aspects of the Roman Empire. I've recently began using stations as a way to engage my students through different modalities. It’s been a great way to provide a large deal of information through different sources, provide my students a chance to move, and provide my students a chance to spend time on the iPad. I've used the iPad so far during the stations as a way for students to unscramble, analyze, and write about images of ancient Rome. I've used the Puzzler app as well as Puzzle You app, which are both free, to create the photo puzzles. Its been a fun way to have the students immediately interested in analyzing the images as well as allowing for students who are inclined to solve puzzles to apply those skills in the class. Throughout the remainder of this unit I will continue to use the iPad during future stations as well as prepare the students to showcase their best work to the class. I’ve also begun using the iPads during the extended day. I work with many students whom struggle with spelling and writing. I have recently begun a Scrabble tournament with the 12:1 class. It’s been awesome seeing my struggling spellers use the free Scrabble application’s dictionary to create new words and check the spelling of known words. It’s also been a successful way to end our day with some peaceful and fun competition. May/June.... Wrapping Up or Starting New? At a time of the year when some are starting to wrap things up, think about end-of-the-year trips/activities and look forward to “next year” I find myself still excited to plan lessons for this year. Why? The addition of iPads to my curriculum has made every unit, every lesson I've taught in the past a brand new experience. Needless to say, for someone that has been teaching for 11 years that brings new life and exciting opportunities to the job. I decided to end the year with a persuasive writing unit which has proven to be successful over the past few years. As with any unit/lesson, I try to grab my students’ attention from the very beginning with a topic that will fascinate them.This time around we are going to focus on FAST FOOD. Simply mentioning those words perks up a bunch of middle schoolers. After doing some close reading and intense research my students will write persuasive essays, create slogans and advertisements that promote healthy living habits. In the past my classes have done this using basic loose leaf, chart paper, poster paper, pencils and markers. But this time students will be using iPads to create advanced versions of what students in the past have done. We will begin by using the iPads as digital readers. Students will read articles such as “Rain Forests at Risk” and “Get Some Sleep!” on the Time for Kids website. They will use new facts they learn to defend their point of view and engage in accountable talk with their classmates. Each student will be responsible for submitting a written response which they can type and email to me from the iPads. Next we will read Chew on This: Everything You Don’t Want to Know About Fast Food by Eric Schlosser and Charles Wilson. Unfortunately, the book is not available in digital format so we are going to stick to regular paperbacks. Since my students are comfortable using Post-Its while reading, they are going to use the Sticky Notes app (free) to collect facts and ideas that they may want to include in their persuasive essays. 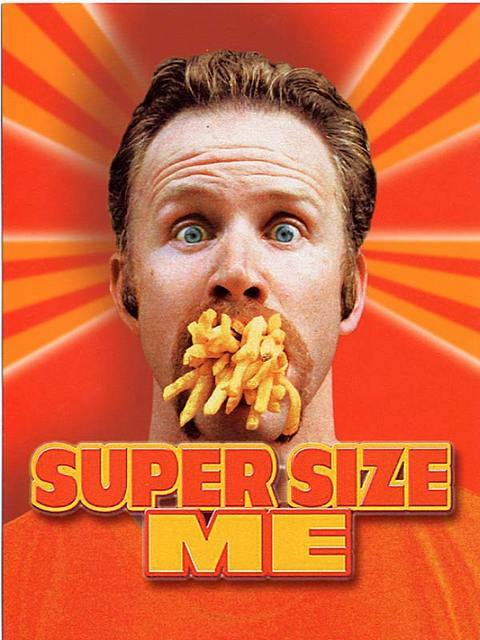 Then we’re going to watch “Super Size Me” with Morgan Spurlock. In addition to gathering notes, we’re going to use the Popplet app to swap ideas with partners. There will be one focus question and students will share their opinions based on what they have learned from the movie and their reading. After publishing their persuasive essays, students will begin to create advertisements for healthy living. Students will use the Phosters app (.99) to create posters that include pictures, slogans and a paragraph to convince the reader to “purchase” their product. The goal is to effectively promote healthy eating habits and living. To close out the year I want to return to one of our favorites, Dr. Seuss. A few months ago when I was looking for “Dr. Seuss-ish”/poerty apps I was thrilled to find that several of his books were available in app format. Oh, the Places You’ll Go ($4.99) is a classic and I want to use it to have my students to reflect on the past year, set short and long term goals for the future. I’m still not clear on what that final project will look like, but that is the exciting thing about working with iPads, there is always something new to look forward to. In the education world, the words "May" and "June" carry heavy connotations. For some educators, "May" and "June" carry hope, a light. Ah, summer is almost here. For others, "May" and "June" signify an imperative job: I must keep my classroom and lessons engaging. We realize if we don't, the "almost" of summer will quickly turn into the "almost" of insanity. The equation is clear: Disengaging classrooms plus disengaged kids equals disaster. representation of who and what is important to us, who and what is inside our hearts. Heart mapping alone boosted our post-testing drowsiness immensely. Hands down, my kids' level of engagement during heart mapping was the highest it's been since before test prep. Let's face it, endless multiple choice questions are no fun - for teachers nor students. 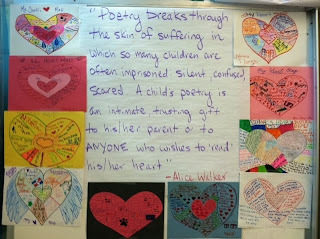 Starting next week, we will be starting poetry stations (thank you again, Ms. Heard). While activities similar to heart mapping will have their place, there will also be two iPad stations. Last week, my students came up with a symbol and writing system to mark up a poem. For example, if students draw a lightbulb next to a line, they have an idea. Next to the symbol, they explain their idea. If you see a picture of a person, my student has a text-to-self connection that you can also read about next to the symbol, etc. In the first iPad station, we are going to transform these skills digitally using the Popplet app. 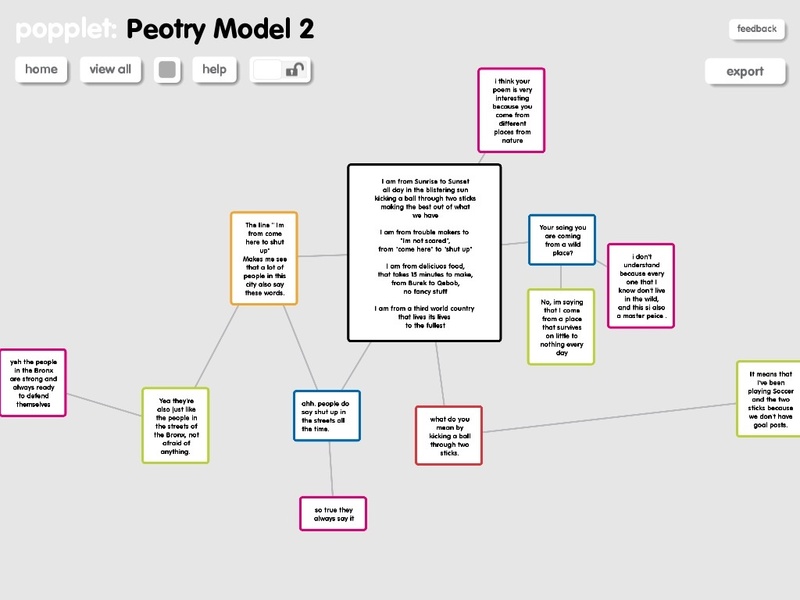 Each student will type one of their own poems inside a black Popplet. 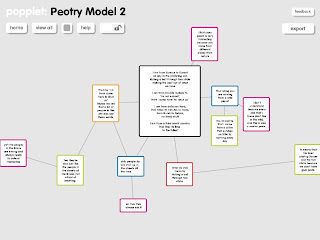 Then, students will switch iPads to digitally mark up (using color) each others poems with ideas, questions, text-to-self connections and thoughts on powerful/meaningful words, images and/or lines. Here is a rough-draft example of what one group already started working on during an after-school enrichment block. 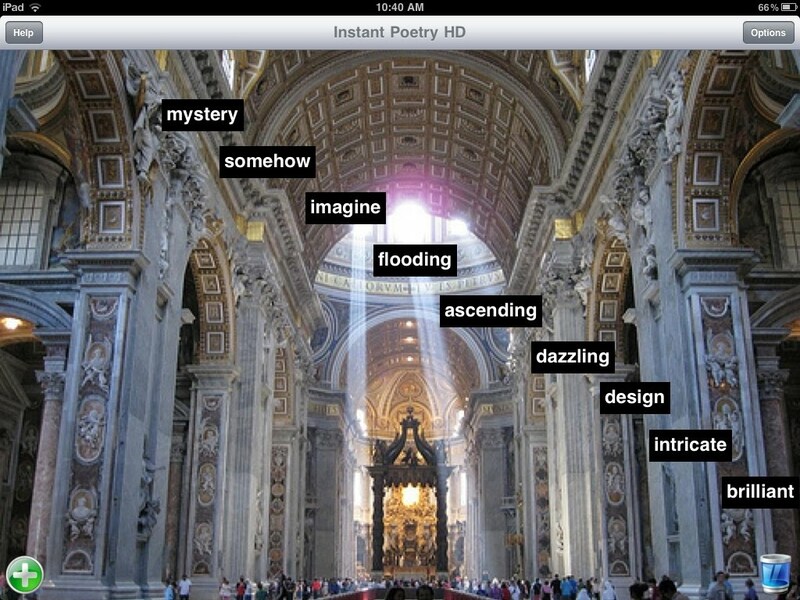 At the second iPad station, students will be using the Instant Poetry app to create poems using images and words. This station will be centered around their current unit in social studies: Ancient Rome. I plan on creating folders on each iPad where students will be able to observe images and art from Ancient Rome. In a separate folder, I will place non-fiction texts about Roman topics such as religion, leaders, art, the gods, architecture, etc. After students read and study the articles and photos, they will have the opportunity to design their own Roman-inspired masterpiece. I am looking forward to see how well these activities will keep my students engaged until June 28th. Forget the disaster equation. I want room 102 to prove that engaging classrooms plus engaging learning equals hardworking students...no matter the time of year. Testing season has come and gone for most of our students with the NYS Math Exam ending yesterday. 8th graders still have their Science and Math Regents exams coming up, but 6th and 7th graders are done with their testing. It's been nice to see and feel the collective sigh of relief the day after. As an 8th grade teacher, my students have been working pretty hard on preparing for the Science Exam. In math and ELA, they've been building their portfolios and preparing for end of year procedures. We still use the technology in class for various reasons- practicing skills on iXL and using apps to achieve their IEP and graduation goals. As we get closer to the finish line and wrap up the year, I look forward to giving my kids the challenge of leaving a legacy for future classes- a message on the best ways to use the ipad in and out of class. The good news is that most of the class is very familiar with the iPad and can easily do this. The bad news is that most if the class is rather camera shy. We'll see which one wins out. As a dean, the iPad has still been invaluable. For the past couple of weeks I have been out of my classroom/office and running an Intervention Room for 8th graders who needed Herculean efforts to achieve passing grades. Each student would come down daily with the task of completing past and extra assignments and test prep to achieve high enough marks to get a passing average for the year. Using the iPad as my hub, I was able to keep students up to date on what work they completed needed to complete and provide live updates on averages. I was able to pull all information they needed for various websites such as Prezi or iXL with the touch of a finger. For the students who took to the intervention and came focused to attempt to pass, the iPad was their tool to keep track of their progress. It even helped them when I was able to use the iPad to maintain control of the students who refused to take advantage of the opportunity before them. Sometimes it was by using LiveProfile to immediately reach out to those upstairs to contact homes and parents. Other times, I used it to keep chatty students occupied while I conducted small group instruction with a different section. That group ends today and I look forward to returning to lunch with the iPad. Until I began working in the Intervention room, I didn't realize how much I enjoyed using the iPads with Teheran students. Whether it was playing the games with them or talking with them while they played games like AngryBirds, NBA Jam, or PengAireborne, something about the iPad allows our students to open up and talk about anything. 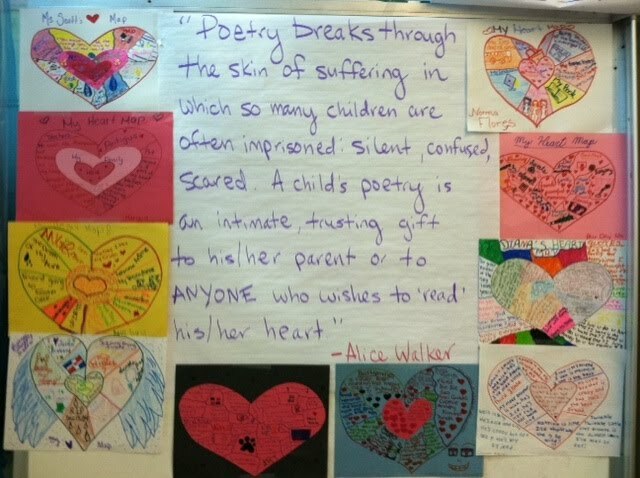 One of our Social Workers Mark Walters wrote about this in his blog post insert mark walkers blog post link. It'll be nice to reconnect with our students. I'm also looking forward to an upgrade. This month, I will be one of the staff members piloting the use of the iPad 2. I actually haven't seen or used the second version of it yet so I'm not sure what new things we can do with it just yet. But I have some ideas that would be incredible to have work for our students. A confluence of events led me to look forward to one idea that has me really excited. The first was that i recently got a new 4G phone with Facetime and have been loving video chatting with people far away that rarely get to see. Second, about a month ago a friend and were in my house watching some NBA basketball and shooting the breeze. He was really excited because he had just discovered that phone upgrade would allow him to create a mobile WiFi hotspot. And since he didn't have the 3G iPad this fixed his internet on the go issue. All his problems were fixed. As he was showing me how it worked, the commercial with the two classes video chatting came on. I love that commercial just because I've always believed kids learn more when they are exposed to new things and when they are learning from another kid. Eureka! The iPad2 can be our vehicle to connect across the nation, continent and globe. Just a thought....we will soon find out if we can make it happen. April Flowers bring May flowers…Bring the iPad II??? - Is it really better? - How can I make its updates features work for me? The fact that it has a camera is a definitely a huge plus in my world. I am a big believer in documenting my students in action. I have always found that they like to see their hard work on bulletin boards and I like the ability to display it for them. The iPad II should stream line that process. But the students and my interaction with them is a small role compared to my work with the teachers and the fact that I will have the ability to document their work is even more exciting to me. I can’t think of a better way of publicly commending the great things that are happening in our school then through the use of the iPad II. Whether it remains a strictly digital display or we combine it with printed work, the fact that we can have it readily available is an invaluable tool. Even better, we will be able to have a quick pictorial of our successes for years to come. I am also excited about being able to quickly record something great that is happening in the classrooms and around the school. So with little time left in the school year my plan for the iPad II is to document as much as I can and begin that picture library. I can’t help but think about the ways in which Sir Ken Robinson said we need to look at education differently, and I do believe we are with the use of the iPads. We are moving our students to a place in which they are thinking outside the box and working with tools and resources that will give them the opportunity to be leaps and bounds above their peers. The iPad II is only going to enhance that experience. As for the idea if it is really better - that will be in my next post!!!! What are my plans for May? As we all know, the end of the year is approaching. So the question is, "How will I use my iPads these last couple of weeks?" Well, my iPads will be used for various projects in both my 6th & 7th grade math classes. In the next couple weeks, I plan on having my students prepare a Bronx Green Middle School Vocabulary book, where they will have to define, illustrate, and explain the key vocabulary words that a 6th & 7th grade math student must know. They will use their textbooks, reference books, as well as the iPads to look up information. Some of the other projects that I have planned, will be graphing skittles, and figuring out percentages using what they know. The iPads will be used in various ways to assist them. The iPads will be used as an educational piece for students who might of forgotten how to convert fractions to percents. As well as, use their iPads to graph their data that they have collected. They will use the website, "kid's zone", to create both a Bar graph as well as a Circle graph. Last, I will have my 6th grade students design a book for Architects, explaining various mathematical operations in order for an Architect to be able to use as a reference to help them build and design a building. They will apply what they learned about fractions and measurement to answer various questions that have to do with real life situations. They will use theirs iPads to help them create their books, as well as an educational tool to help them learn what kind of work an Architect does. 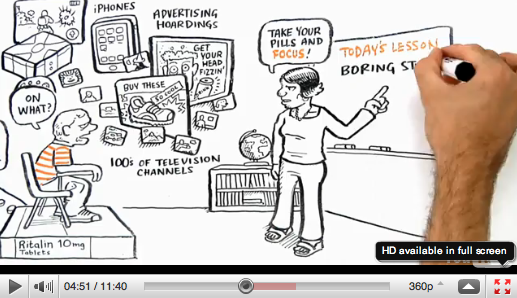 For the month of April we examined a video clip by Ken Robinson titled 'CHANGING EDUCATION PARADIGMS'. Since we are a school in transition and have access to new technologies (iPads) to aid this transition we are looking at the ways iPads can assist teachers/administrators/support personnel in fostering divergent thinking. How to get the most instructional mileage out of new technology, how to develop our learners into pioneers of higher-order thinking, how can we reshape a broken educational model? These are all questions that arose out of this video and our discussion. "The current system of education was designed and conceived for a different age...the culture of the enlightenment and industrial revolution...intellectual model of the mind (then) says: real intelligence consists of deductive reasoning and knowledge of the classics." On fostering collaboration: "most great learning happens in groups." *Sir Ken Robinson is an author, speaker, and international advisor on education in the arts to government, non-profits, education, and arts bodies. He was Professor of Arts Education at the University of Warwick (1989–2001), serving four years as Chair of the Department of Arts Education, and as Chair of Research Development within the Faculty of Education. He has also held the posts of Director of Undergraduate Studies in the Warwick Institute for Education, Program Director of the MA in Arts Education and Cultural Studies, and Director of the Unit for Research in Education, Culture, and the Arts (URECA). In June 2003, Robinson was knighted for his achievements in creativity, education, and the arts.The video was viewed nearly half a million times in its first week on YouTube.